I know this doesn’t look like much as I haven’t done his head but it will completed soon. 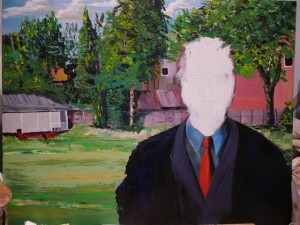 The outgoing headmaster of Wrekin College in Telford has kindly commisioned me to do his portrait. Should be done by July. Time oh time where art thou? There is always a challenge as an artist to capture the imagination of a client. Still don’t see the point of it all but maybe I will fall in love with the tech. I have added a new section of my artwork on the website so go and grab a signed print.To be true folks it’s been a while – and I have been back home for a short wee while.Went to Northern Ireland a couple of weeks ago and caught up with our good friends Paddy and Claire.In fact I even got them to do a music video for the song She Deserves from Aurelia so that will be available soon.But I digress. 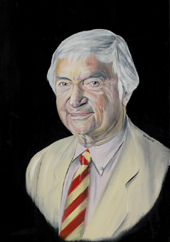 I will be adding some things retrogressively as this is a new blog and yet I have tons of stuff form over the years.I will be adding some of my artwork such as the painting of Richie Benaud the great Australian captain and commentator ( donated to the MCC for the Tsunami appeal.) and others from the cricket world such as Wasim Akram and Murray Goodwin.